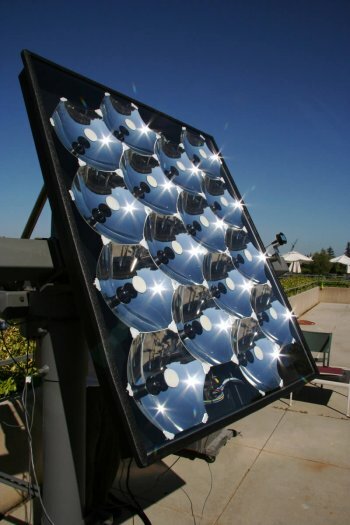 Solar concentrator array by SolFocus, Inc., Palo Alto, CA. A concentrator is a solar module that uses optical elements to increase the amount of sunlight incident on a solar cell. Concentrators arrays must track the sun and use only direct sunlight because the diffuse portion cannot be focused. Efficiency is increased because the power flux of sunlight is increased hundreds of times, but lifespan is usually decreased due to the high heat.